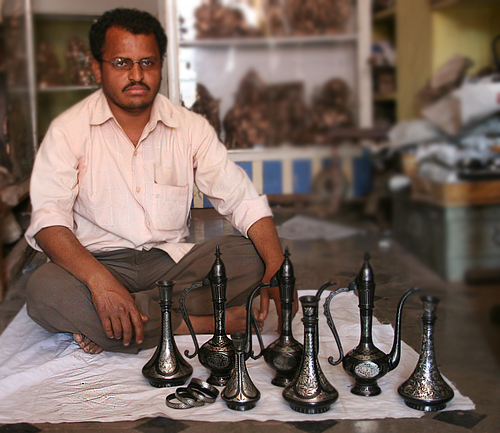 The gleaming silver on black of Bidriware has enticed many people. Few know that the art originated in Bidar, a small town in North Karnataka. Here’s a look at the science and people behind Bidri. Narsappa Nageshwar was a proud man when his elder son, Rajkumar, secured a seat in an engineering college. To his disappointment, Raj dropped out of college in the Second Year and returned to his first love – Bidri. Raj’s grandfather, a master craftsman who had won a state award, perhaps, would have been proud. For Bidri work is an ancestral craft passed from father to son – Raj’s family has now been carrying on the trade for close to hundred years. Sturdy and almost unbreakable objects in various shapes and sizes, jet black in colour, come alive with dazzling silver inlay work. This is similar to the Persian art of inlaying Gold and Silver in Copper. In fact, the Persians immigrants taught the art to locals in Bidar during the Bahmanis’ reign. 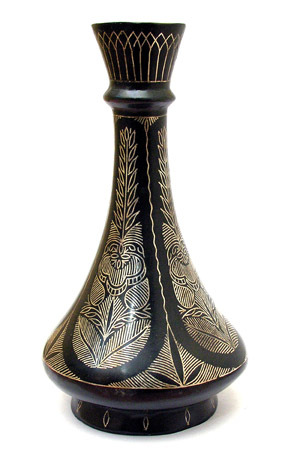 Though of Persian origin, down the ages Bidri work has developed its own unique form and style. There are about 200 articles which are perennial best sellers. These include animals, , boxes, idols, flower vases, photo frames, bed lights, jug shaped vessels,, lamps, ashtrays, paper weights and ornaments , Though the articles are common for all hoses, subtle variation is introduced in design which will be unique to the products coming out of the house. Though these design changes are not patented, every Bidri craftsman follows the code of honour – no copying of the design from another house. A bidriware is basically made of zinc and then treated with copper sulphate. Now the designer takes over. He marks the pattern-design using a grooving chisel and hands it over to the next skilled person. The design is chiseled further to make deeper grooves. Silver wire is then inlayed inside these grooves. Buffing smoothens the surface of the unfinished showpiece. Then starts the process, which gives Bidri work its unique character. Soil found in the Bidar fort (which has oxidizing properties) and Aluminium Oxide is mixed in water and boiled. The bidriware is then dipped in the boiling solution. The solution affects the Zinc alloy turning it black. The inlayed Silver retains its colour. The black and white bidriware is cleaned and polished. The product is now ready for the shelves. As you can see, Bidri is a labour-intensive, time-consuming process. Adding to the burden is the high cost of raw material. A Bidri work when it is ready usually finds no taker in the town for its cost is prohibitive. There is no significant sales to tourists either as Bidar isn’t a popular tourist destination. As a result, direct sales form a very small percentage of the revenues – 10% according to Raj. Exporters and city based retailers who place orders as per requirement are the primary customers for the local artisans. These middlemen, however, tend to give the local practitioners less than their fair share of money. After clearing all his bills, Bidriware fetches Raj about Rs. 12,000 – 15,000 a month. He supplements his earnings by selling other less expensive decorative wares popular amongst local people. In spite of the low returns, the Bidri trade employs close to 400 workers in this small town, earning wages ranging from Rs. 1500 to Rs. 4500. Not every worker involved in this process is illiterate. Most children go to school until Class VII. It’s when the child fails to show an aptitude towards formal education that he drops out and takes up Bidri work. It’s ironic that school dropouts end up keeping this tradition alive. That doesn’t mean the hunger to do better is any less. Raj can sense the change in the wind outside his small town. More tourists produce credit cards these days. Raj is now trying to find out how safe the transaction through credit card is. He has also heard about Internet and the advantage of reaching out to consumers, both in India and abroad, directly through the net. First priority is, of course, providing for credit card deals. Meanwhile, he has compiled photographs which explain the Bidri process – ideal to woo the choice-spoilt 21st century tourist. And when he visited Dilli Haat last year, the album went with him on a CD. Raj is doing everything he can to pack that extra punch – he is even planning to print the whole Bidri process on the back of his visiting card. Narsappa is happy and proud, of course, but still feels that Raj should have finished with his BE and taken up a ‘proper’ job. Raj and his band of dropouts, on the other hand, have put their heads down, learning and adapting in the best way possible to meet the future. This entry was posted in Art & Crafts, People. Bookmark the permalink. Many times I’ve checked the Bidriware at shops, never picked one up. Didn’t even knwo it was called Bidriware. Nice to know about the hardwork behind this.